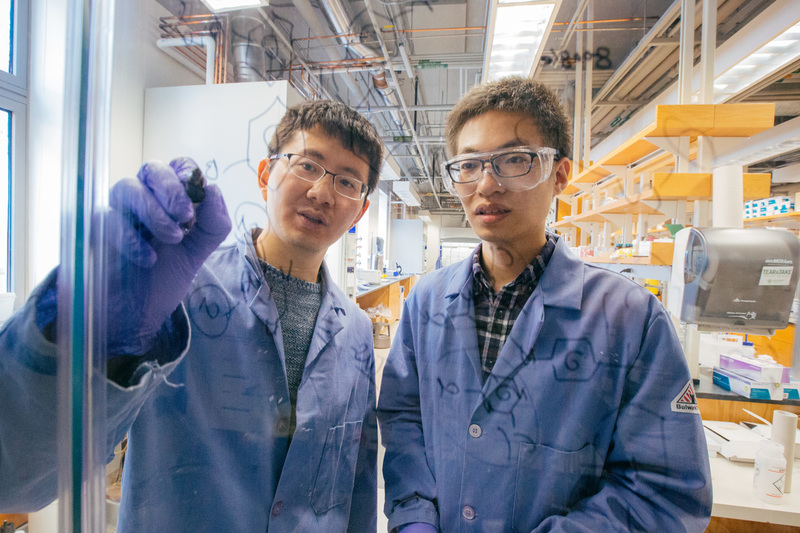 3.22.2019: Congratulations to Mingshi and Longyu on their recent advancement to 3D print the first set of homogeneous and heterogeneous COFs! This work was just accepted in JACS. 2.11.2019: Chenfeng received a 2019 Cottrell Scholar award from the Research Corporation. 2.8.2019: The Ke group was awarded the NSF CAREER award for the development of elastic crystalline porous organic framework materials. Read the highlight here. 12.27.2018: The Ke group academic tree is growing! Chenfeng visited formal postdoctoral fellow Xuanfeng Jiang's group at Hubei University, Wuhan, China. 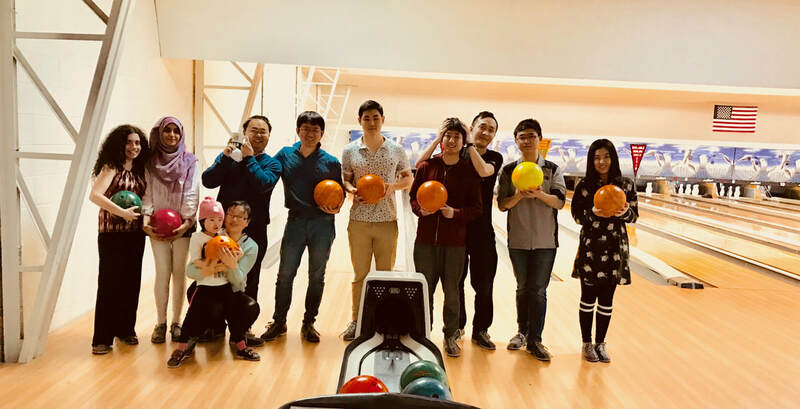 12.14.2018: Congratulations Haoyi Wang on successfully defended his master thesis. We wish you best of luck for your future steps! 9.19.2018: NSF EPSCoR program fund the joint effort of Center for Multiscale Modeling and Manufacturing of Biomaterials (NH Bio-Made). It is exciting to be part of this research team! 8.24.2018: Congratulations Ruba of being selected as a Junior Research Scholar! 8.22.2018: Congratulations Qianming Lin on receiving Neukom Travel Grant to present his work at the MRS Boston this fall! 8.15.2018: The group welcomes Dr. Andrew Duncan joining us as a postdoctoral research fellow! 8.15.2018: Goodbye Jonnathan! Thanks for spending a nice summer month with us. 7.13.2018: One-year collaboration project with Qrons.Inc signed. Press release. 7.1.2018: The group welcomes Mingshi Zhang (graduate student) and Joannathan Marin (ASURE) joining us! 6.25.2018: Xunzhe presented her work on elastic porous materials in crystal engineering GRS and GRC. 6.7.2018: Congratulations to Samuel Kim '18 won the 1st Place in the Christopher G. Reed Senior Honors Thesis Science Competition and being listed as the finalist of Gazzaniga Family Prize! 6.7.2018: Congratulations to Samuel Kim '18 received The Chandler T. White 1916 Research Prize, and Oliver Darwish '18 received The John L. Zabriskie Jr. '61 Senior Chemistry Prize for their outstanding honors thesis research works! 6.1.2018: Congratulations to Samuel Kim '18, Oliver Darwish '18 and Dang Khoa Tram '18 completed their chemistry major and successfully defended their research work! 4.16.2018: Chenfeng joined the Science Advisory Board of Qrons Inc.
4.13.2018: Bye bye Xuanfeng~ Good luck at Hubei University! 3.8.2018: Xuanfeng has accepted a full professorship (Hubei province 100 talent program) in Hubei University, China. Congratulations Xuanfeng! 3.5.2018: Longyu's paper was accepted by ACIE as a VIP paper, congrats Longyu! 11.30.2017: Hao-yi and Qianming presented their posters at the national MRS 2017 fall meeting. Hao-yi's poster was selected as a Best Poster Award Nominee, congrats Hao-yi! 10.30.2017: The group acknowledges funding support from ACS Petroleum Research Fund on developing hydrogen bonded porous polymers. 9.15.2017: The group welcomes new graduate students Xunzhe Cui and Miao Tang. 8.15.2017: Xuanfeng presented his poster at the nanoporous GRC. 7.27.2017: Group alumni Yunxiao Lin was awarded Zhiyuan Distinguished Student Scholarship by Shanghai Jiaotong University based on his outstanding work carried out in the group. The scholarship is established to award undergraduate students who demonstrated great potential for their future academic career. Congratulations Yunxiao! 7.24.2017: Sam Kim was awarded 2017-2018 VKCSF Scholarship, Congrats Sam! 7.3.2017: Dr. Longyu Li joined the Ke group, welcome Longyu! 7.3.2017: Qianming presented his 3D printed polyrotaxane machine at the ISMSC-2017 in Cambridge, UK, where he met his academic grandfathers, Prof. Anthony Davis and Sir Fraser Stoddart. Travel fund is supported by Royal Society Newton Fellowship follow-on Scheme (C.K.). 6.20.2017: Hao-yi was recognized by undergraduates as an outstanding graduate student teacher! Congratulations Hao-yi! 5.17.2017: Chenfeng gave a talk at the Spring 2017 UMass Amherst Polymer Event. 5.15.2017: Our group first paper in porous organic material was accepted by JACS! Congratulations Yunxiao and Xuanfeng! 5.11.2017: Oliver Darwish '18 has been awarded a 2017 Zabriskie Summer Undergraduate Research Fellowship to conduct research in the group. Congratulations Oliver and welcome to the Ke group! 4.14.2017: Prof. Jeremiah Gassensmith from UT Dallas visited our department and the Ke group. 3.31.2017: Farewell Zhiyun. Zhiyun has been working on porous organic materials and 3D printing materials in the past year. Thank you and all the best for your future career development. 3.2.2017: Prof. Yan Zhao from Iowa State University visited our department and Ke group. 2.27.2017: Our research paper was accepted by Angewandte Chemie! Congratulations Qianming Lin! 2.15.2017: Farewell Yuxiao. Yuxiao will continue his undergraduate studies at Shanghai Jiaotong University. Thank you and all the best! 11.04.2016: Prof. Ron Smaldone from UT Dallas visited our department and Ke group. 11.04.2016: Chenfeng was highlighted in Nature Chemistry blog. 10.18.2016: Congratulations to group alumni Alex Cheng for being selected as a Siemens competition semi-finalist based on his outstanding work done in the group during the summer 2016! 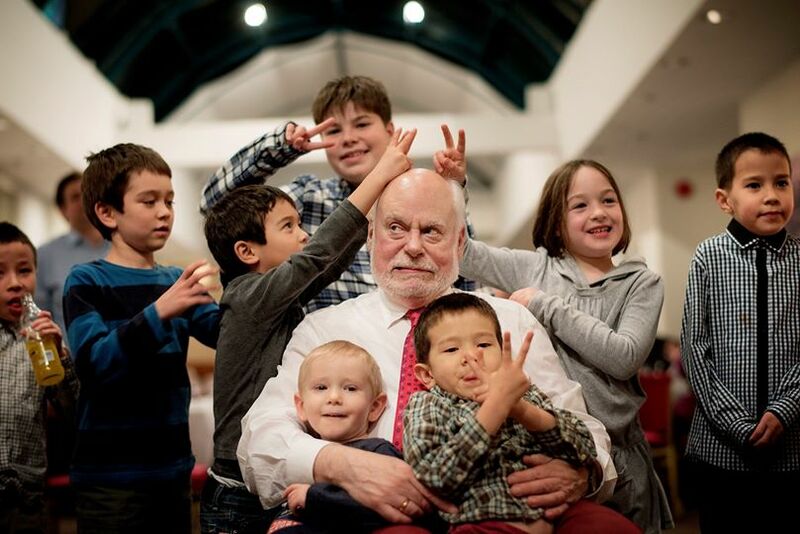 10.5.2016: The Aprahamian group and Ke group celebrate for Sir Fraser Stoddart winning the Nobel Prize in Chemistry 2016! 8.13.2016: Alex Cheng completed his 3-month internship in our group. He built a customized 3D printing system. Well done and best of luck, Alex! 8.3.2016: Samuel Kim (18') was awarded the Undergraduate Research Award to conduct his research project in the group during the coming fall term 2016. Welcome and congratulations Sam! 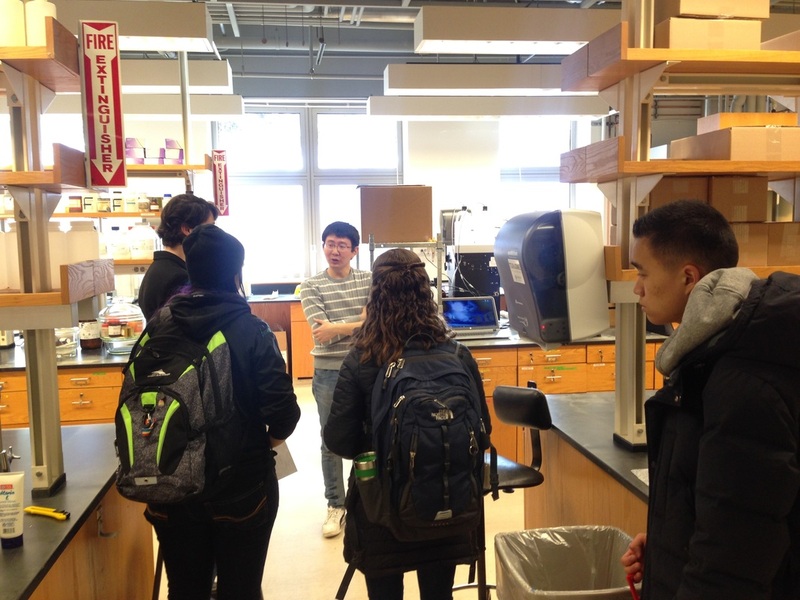 7.19.2016: Chenfeng's Chem52 class Organic Chemistry II is supported by Dartmouth College Gateway Initiative. July 2016: First year graduate students Hao-yi Wang and Qianming Lin joined our group. Welcome Hao-yi and Qianming! ​6.8.2016: Hyungdon (Don) Joo (19') was awarded the Sophomore Science Scholarship to continue his research project in the group during his Sophomore year. Congratulations again Don! ​5.26.2016: Prof. Anthony Davis from University of Bristol visited our department. ​May 2016: Dr. Paul McGonigal from Durham University visited our department. ​5.17.2016: Hyungdon (Don) Joo (19') was awarded the First-Year Summer Research Award to conduct his summer research project in the group. Congratulations Don! ​5.17.2016: Alex Cheng from Texas Academy of Mathematics and Science was awarded 2016 TAMS Summer Research Scholarship to conduct his summer research in our group. Welcome Alex! 2.26.2016: Undergraduate researchers Hyungdon Joo (class of 2019), Charles Springer (class of 2017) and Yunxiao Lin (class of 2017, Shanghai JiaoTong University) joined our group! Welcome all of you! 2.12.2016: Dr. Zhiyun Zhang joined us as a research associate, welcome Zhiyun! 2.1.2016: Dr. Pengfei Zhang joined us as a research associate, welcome Pengfei! Dr. Chenfeng Ke will start his group at Dartmouth College in Sept 2015.